Like many, it has always been a dream of mine to come face to face with the greatest animal on the earth. The elephant. There’s something about their sheer size and power that attracts thousands from all around the world to interact with them, whilst their emotional and mysterious lives continue to surprise us on the daily. However, even to this day, tourists are still funding industries that neglect the welfare of these magnificent creatures, taking part in rides and attending circus performances, and whilst videos exposing the devastating procedures behind these attractions circulate on social media, tourists are still seeking to take part in these inhumane activities simply tick off their bucket list. This April, during a long-awaited Easter break from teaching, I made my way to Thailand for what ended up being the trip of a lifetime. 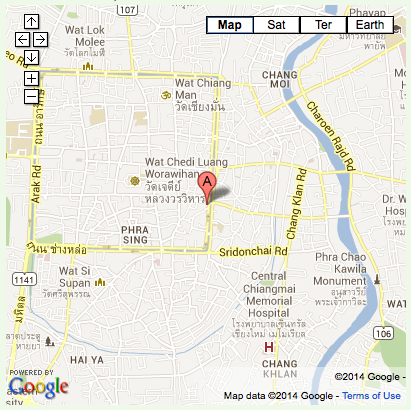 Some may think Thailand is a long way to travel to see an elephant. I disagree. 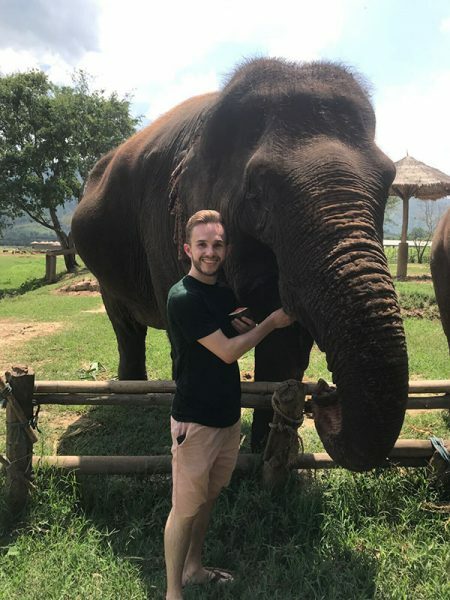 Having traveled to Chiang Mai, and with a trip already booked to Elephant Nature Park, the day had finally arrived for this dream of mine to come true. 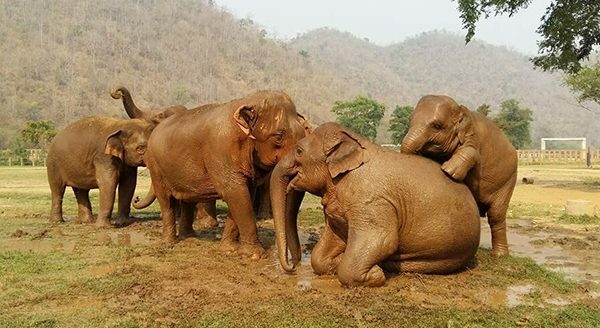 I had booked the ‘Care for Elephant’s excursion with the sanctuary, having done extensive research beforehand as to what sanctuaries were what they claimed to be, and which of those sanctuaries were riding camps. This particular excursion was designed to relieve riding elephants that belonged to neighboring mahouts (elephant trainers) from their riding duties, with the park educating the mahouts on how to care for their elephants, explaining also how there are alternative methods of making money from tourists that can replace riding the elephants. The brutality behind elephant riding was soon made clear to us as we embarked on our journey to Elephant Nature Park and the fact that tourists are aware of the neglect behind riding and still choose to take part in it astounds me. After being picked up from our hotel, our guide, Nik explained to the group how riding elephants and that of those in the entertainment and/or logging industry were once calves taken from their mothers. 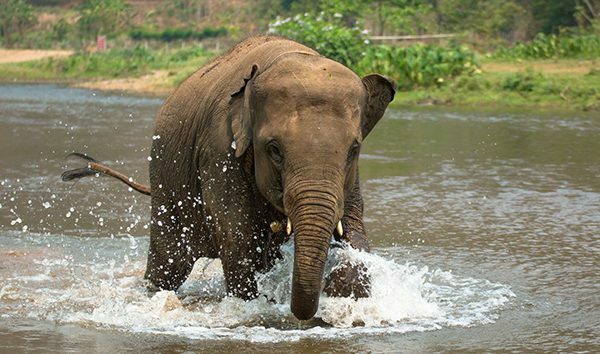 For elephants to perform these unnatural acts, they must first endure a process called ‘The Crush,’ in which they are starved, beaten with bull hooks, and in effect immobilized through ropes until they learn to fear their mahout. In short, their souls are crushed. Nik continued to explain how the elephants at Elephant Nature Park had all been rescued from working lives, whilst also providing us with valuable information on both the elephants and the park itself, making even our journey to the sanctuary a very memorable and heartfelt experience. Before I knew it, we were in the mountains, surrounded by vast fields and of course, elephants. The sun beamed down onto a heard bathing in the river, and as we made our way over to where we’d meet our elephants, my excitement was taken to yet another level. Nik had arranged for our intimate group of 6 to meet a one-month year old calf, and well, that was me done. What an experience! For something so vulnerable and innocent, it broke my heart at the thought of babies as young as this calf being taken from their mothers, having also learned that they typically depend on their mothers up until the age of 15. With my baby fix fulfilled, we began to chop watermelons and pumpkins in mass. With four huge buckets full and the sweat pouring from my forehead, we then greeted our friends for the day. 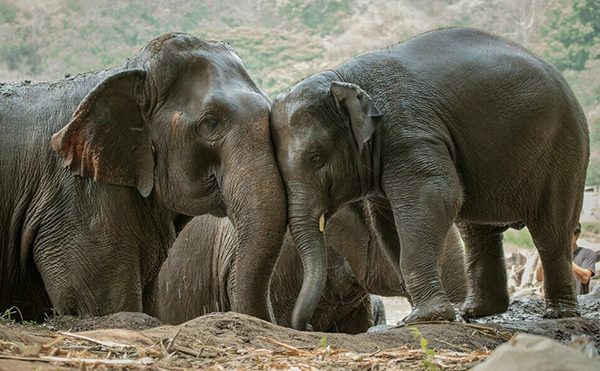 Two magnificent female Asian elephants approached us, their trunks swinging and sniffing out their juicy treats, and though the day had just begun, I had already confirmed that it was the best day of my life. And this feeling only continued to grow throughout the day. Our day was devoted completely to “elephant time,” feeding and interacting with the elephants, and having photos with them, whilst Nik continued to educate us about them as we walked with them up into the mountains. After a delicious buffet lunch that overlooked the park, we then made our descent and walked our giant pals down to the river. There we washed, splashed and scrubbed their wrinkly skin, their gigantic bodies blocking the current of the river like breathing dams, and having now spent over 6 quality hours with these amazing creatures, I couldn’t understand why people would prefer to spend a matter of minutes straddling them uncomfortably, all the time knowing that they were miserable and abused as a result. To finish our day, Nik gave us a tour of the Park, introducing us to over 60 elephants of all different ages and sizes, explaining the disabilities of those they had rescued and how they cater to their needs. The park was huge, with endless roaming space for the elephants, comfortable bed quarters, all combined with endless amounts of love and of course, food. 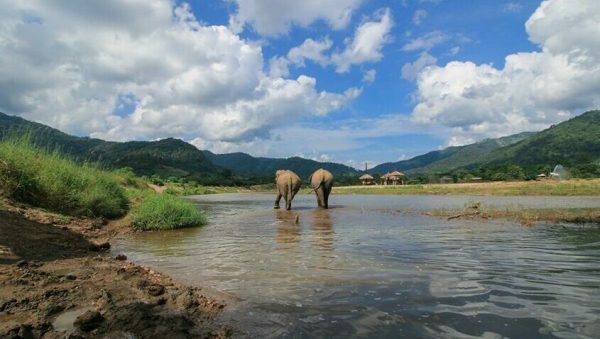 To anyone wishing to interact with elephants, please make the right choice and do it through Elephant Nature Park. 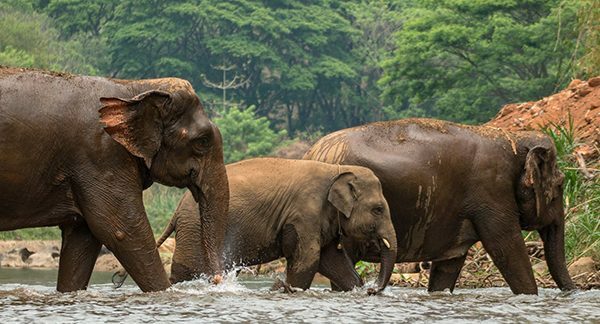 There is no excuse nowadays for riding elephants, no matter how strong the desire to do it is, and with parks such as this offering unforgettable experiences such as these, and at reasonable prices, it’s a no-brainer. I wish I could explain every moment of my day, but for that I’d need to publish a novel, and if I’m honest, I could tell you about it as much as I like… It will never be the same than if you made a visit yourself. Thank you Elephant Nature Park for what I can only explain as the best day of my life, all of the amazing work that you do for these beautiful creatures, and I look forward to my next trip to Thailand so that I can visit you again.